Let's start off with something recognizable. 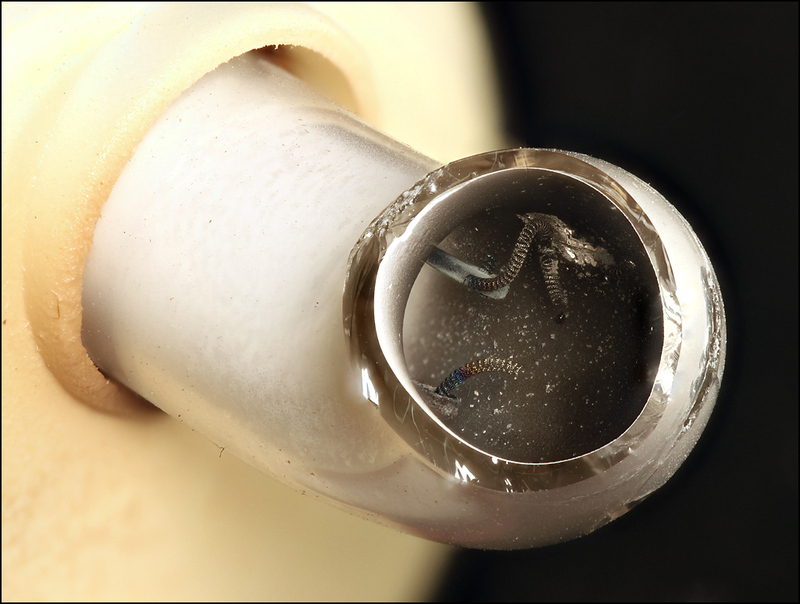 What you're looking at here is the inside of one end of a 15-watt compact fluorescent bulb (CFL). I was motivated to explore this thing because of an interesting failure. The bulb stopped working. That's not unusual, particularly for early models. However, when I replaced it, I happened to notice something that was very unusual: a small hole melted through the glass envelope very near one end of the tube. On closer examination, the hole looks like this. 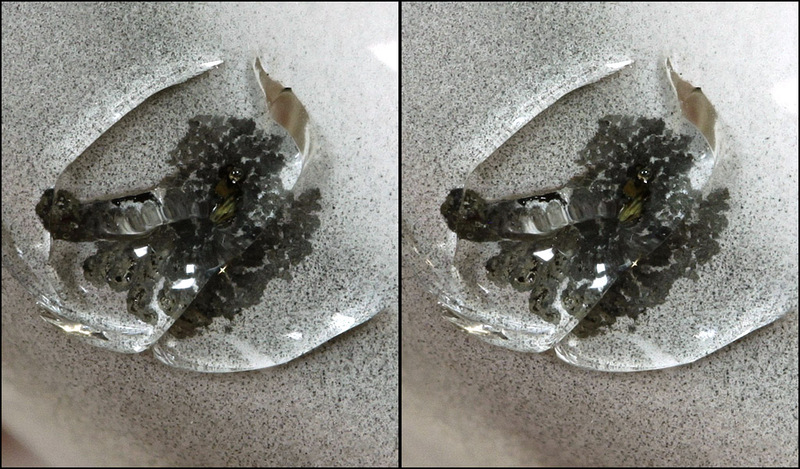 It's a little hard to tell, even in stereo, but the overall shape is a funnel-shaped crater, apparently caused by melting a small area of glass and sucking it in courtesy the near vacuum inside the tube. There's also some cracking around the edges of the crater. This is true stereo, two short stacks shot from different viewpoints. A while later, I had figured out how to cut through the glass tube without shattering it, and had removed most of the tube. At the end without the hole, I removed enough tube to fully expose the filament, so I could get a good shot at it. That's what shows in the picture we started with. Here's the overview of the end with the hole. Bright spots back around the broken filament are light shining through from behind the glass. Looking closer, here's a stereo rendering of the critical area. This is synthetic stereo, cropped tightly from the same stack as the overview. Again, the bright spots are light shining through from the back. I'm not sure exactly how the failure proceeded. Best I can guess is the other filament gave out first, so the arc wouldn't start, and then the bulb left this filament heating for so long that it softened, warped into contact with the glass, melted the glass, and finally blew itself to smithereens when the air rushed in. Notice that there's a short chunk of filament sitting all by itself over near the right edge of the picture, and neither end of the long chunk is connected to anything. It's an interesting failure, and presumably one that the manufacturer really tries to avoid because after the air rushes in, the mercury vapor seeps out. Kind of a slow motion self-breaking bulb. Not a good reputation to have. By the way, in that very first image, you might have noticed an odd structure to the filament. 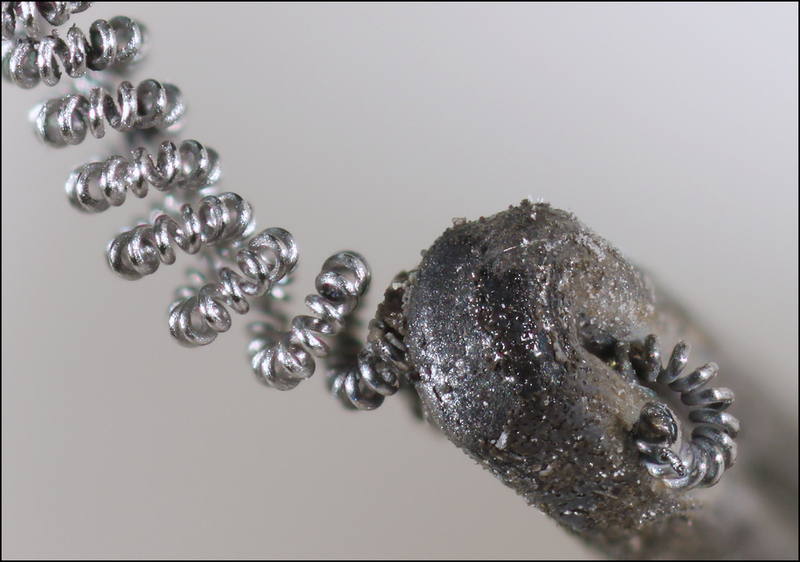 Instead of being just a coiled coil like incandescents use, the filament is actually a coil of fine wire wrapped around a coil of coarse wire. Apparently this structure is something specific to fluorescent bulbs and has to do with its function as a source of electrons rather than light. There's a brief discussion and an SEM picture HERE. However, it would be a mistake to think that coil overwrap construction is found in all fluorescents. Here's what I found inside a different model of bulb, when I took it apart to perfect my skills in glass cutting. 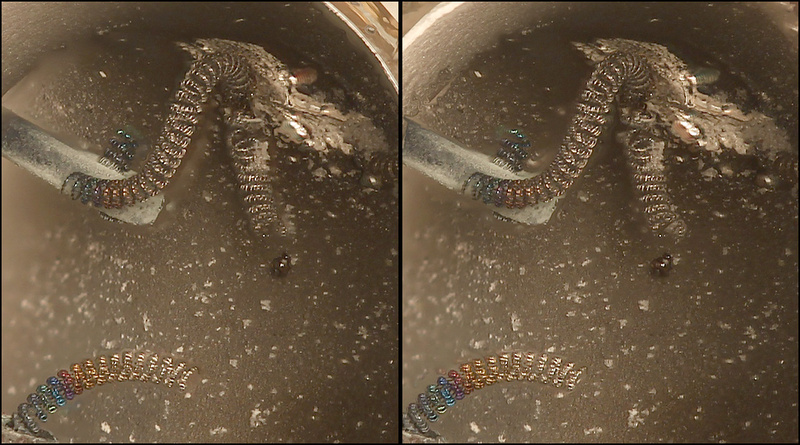 It's a conventional coil, just one strand of wire. I hope you find this interesting. 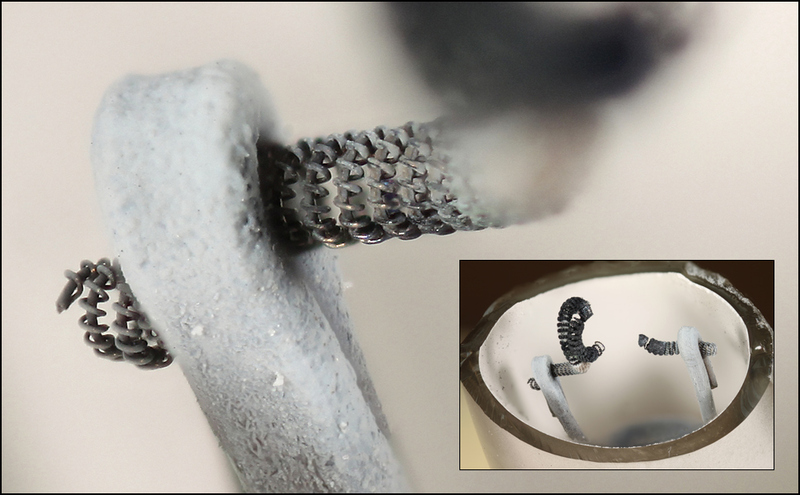 If anybody knows more about that coil overwrap filament structure, I'd like to hear about it. 1. Most images were shot with a Canon 100 mm f/2.8 L IS USM, stepping focus manually with EOS Utility (8 ">" per step at f/5.6). High mag views of the coils were shot with Olympus 38 mm f/2.8 bellows macro lens at f/4, stepped with a StackShot. 2. Glass tubes were cut outdoors, using a small abrasive wheel on a Dremel Moto Tool. No living areas were damaged in the making of these photographs. Rik you really have the stereo thing down. Did I mention I love this site?? I won't have them in the house. I had 2 catch fire...not was enough for me.. Thanks. For my eyes, stereo is a powerful tool for understanding structure, so I've spent quite some time learning how to use it. Being able to generate stereo pairs from single stacks is a real treat. True. That's why I did the cutting outdoors. But quite frankly I am not worried about the amount of mercury in a single CFL. It's about 4 mg. The OSHA limit for occupational exposure to mercury vapor -- 8 hours per day on a regular basis -- is 0.1 mg per cubic meter. 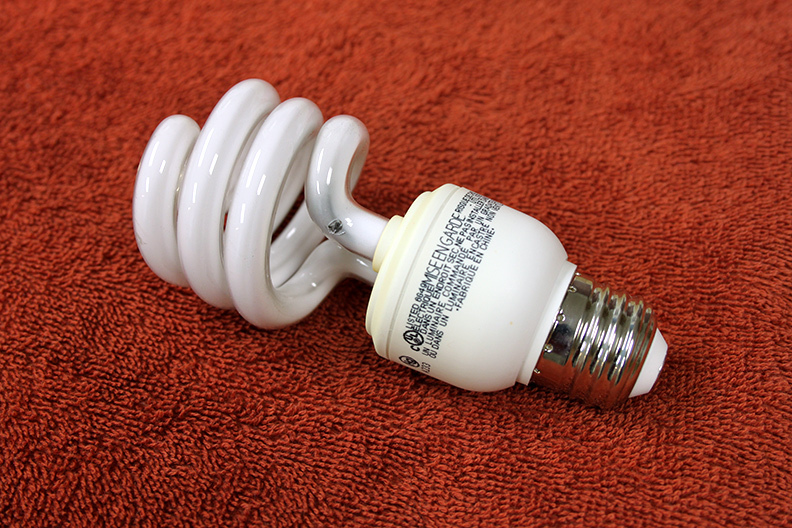 If you break a CFL inside a house and don't even bother to air the place out, you're still well inside the limit for long-term exposure. Open a window and exchange the air, and the exposure from a one-time event drops so low as to be irrelevant. Yeah, I'm looking forward to LEDs. My IEEE pubs say the price should become tolerable in the fairly near future. I had some poor reliability experiences with them too. They are better than mercury low pressure arc based fluorescents (ie CFL and regular fluorescents) but I still have the opinion that it is a pretty big stretch to call what they sell now "white". Not with that huge peak in the spectrum usually around 460 nm. Yes I know they are going to be stuffed down our throats, like it or not. I even do believe that they will make that peak go away sooner or later. But right now I still like my quartz halogen and xenons (flash and arc). I know I am an old dinosaur. I wouldn't worry about the mercury either. I put that stuff in my morning oatmeal to aid digestion. Interesting shots Rik, I had never really thought of photographing one of these bulbs. Might be fun. Being able to generate stereo pairs from single stacks is a real treat. Is this done with dedicated software? Are there some clear crystals in the first stereo pair or are they just pieces of broken glass? It's a feature of Zerene Stacker. See http://zerenesystems.com/cms/stacker/docs/syntheticstereo. Don't know. I think most of the oddly placed bright spots are just misleading reflections off curved surfaces, but I'm not sure. On the inner face of the glass, there are undoubtedly some random flakes of lining. The inside of the tube would have been dark in that picture, so I don't think you're seeing light going through the tube. This contrasts to the second stereo, where light shining through is exactly what the bright spots are. I must keep that in mind when I get back intio using Zerene.